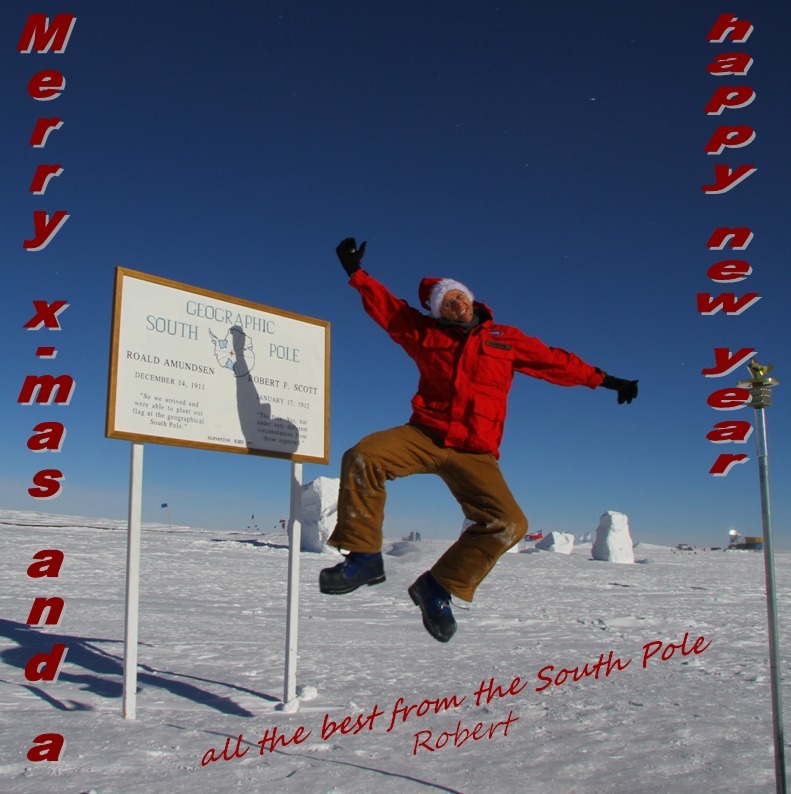 download the Aurora movie 2011 - "Southern Skies 2011"
But I will be back for next winter, so stay tuned! We are left-overs now, not winter-overs any more, the invasion of summer people is finished and there are close to 200 people here on station and only 8 of us left. Another week and we will all follow to the green world. The first 4 members of the SPUD team arrived on the 3rd and since then MAPO is already busy, we took the 3 receivers down the next day, opened them up, replaced filters in two of them and put them back on the mount cooling them down again for testing. 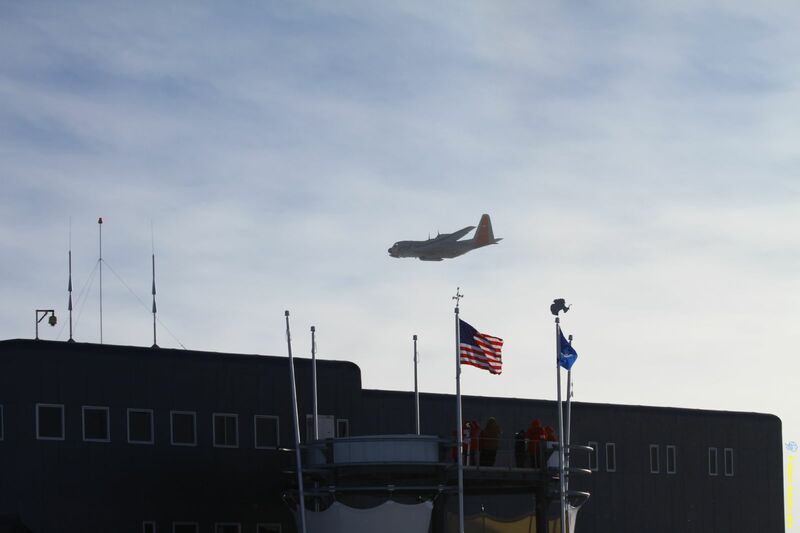 First Herc at the Pole, the two Baslers were canceled and instead about 40 people came in on the LC-130. Finally the first nice day after the storm - without blowing snow or overcasted sky. Yesterday we took our winter-over picture, for the kind of picture I wanted to take, the gray sky was actually favorable. 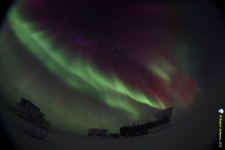 The winter was quite calm, which was great, good observing conditions, cold and not too much drifting. But now it was payback time, we had a week long storm with peak winds of 47kts. MAPO our lab is now buried up to the second floor and we can barely get in and out. Conditions like that also reveal all the cracks in the building and we got quite a bit of snow inside. Sunrise dinner this evening and just for that occasion a break in the storm and the sky cleared enought to give us a glance at the sun, but forecast is really bad and it looks like we are in for some more stormy days. Getting very bright, every day you can see a difference to the previous one now, losing the last stars but the sky is showing beautiful colors again. So yesterday we had our airdrop, went very smooth, got the medication and some spare parts but if the aircrew wouldn't have put some oranges on the little pallet we wouldn't have gotten any freshies, our thanks goes to the aircrew of the C-17 :) so at least everybody got half an orange today, a nice treat, first fresh fruit since March. But how hard would it have been to officially pack another box onto the pallet with some more freshies!? We gonna get an airdrop Monday or Tuesday, to get some spare parts, needed medication we run out of and hopefully some freshies :). Since the planes are in CHC and McMurdo for the winfly (winter flights, a week of season opening flights before main body), it is not such a big detour for them, nevertheless exciting, still mostly dark here so the drop zone will be marked with light wood and JP8 in half barrels, here is a test from today, quite bright. Line of Dialogue: "....which I imbibed rapaciously". Today is the last totally dark night sky, tomorrow the moon will be up and then in 2 weeks, after the moon sets again, twilight will be quite obvious, we just passed into astronomical twilight, i.e. the sun is just passed 18° below the horizon. At today's Met balloon launch we placed a small LED flash light inside the balloon and I took a long time exposure of the launch, a bit to windy, but if conditions are good we will try again. We had to medical emergencies here in 2 weeks both required surgery, but we got just the right docs for that job, the patients are well and both running around again. Already July, time is starting to fly, moon is gonna be up soon and then one more 2 week period of total dark night sky, hopping for some more good auroras. Besides quite low activity we had some awesome displays already. This morning at 05:16 it was solstice, i.e. midwinter for us and the sun is back to our side of globe. The last few days were nice and clear and we had some descent auroras. On Saturday we had our big midwinter dinner, the cooks did an awesome job again preparing a delicious meal. 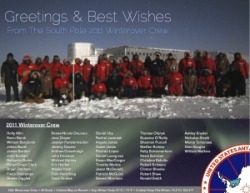 After an old tradition all the Antarctic stations send greetings out and invite the other stations to join them for a nice midwinter meal, knowing that this is of course impossible. Lunar eclipse this morning, but how can it be otherwise, the weather was crap, we saw beginning but the totality we did not, which would have been so awesome since eclipsed moon was very close to the milky way and from our vantage point very close to the Lagoon and Trifid Nebula. 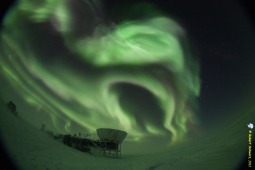 Check out the awesome picture on the APOD site. Last Saturday we had a race through the station - 5km or 18 laps through our long hallways, runners have to run in costumes and it was a lot of fun. It's too cold to do any sports outside so this is a nice diversity. Well Marco is still running outside every day, I don't know how he does it, but he enjoys it and his goal is to run or ski so far that he will reach a point by midwinter where he would see the sun, i.e. 23.5° further North which makes about 2600km and he is pretty close. Today the temperature dropped the first time below -100F (-73.4°C), quite a few people joined the 300 Club. 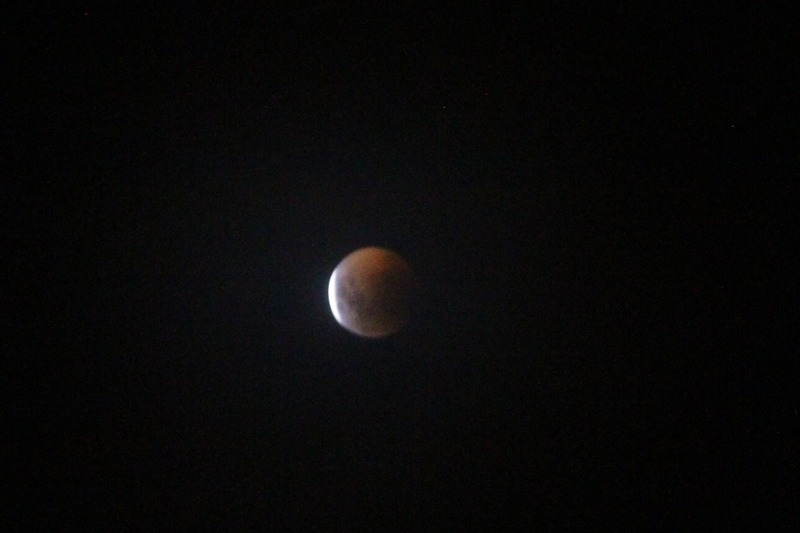 The moon just set again, and now with the sun about 21° below the horizon it's truly dark. Just in time for some good aurora displays again. We had a nice stretch of very clear skies. Finally the auroras are taking off and we had some pretty good ones already :) Now with the moon gone (at least for another 11 days) and the sun more than 15° below the horizon it is also nice and dark and it's great to see the milky way and all the Southern Stars again. The last weeks I was fighting the az drive of our telescope, we had lots of problems with the optical encoders and graphite powder which stuck to everything. Hopefully this is solved now and we know where we are pointing to :). Last Sunday on May 1st Jens, another German, and I made Späzle and two kinds of Schnitzel, worked out great and the crew enjoyed it. Had some nasty winds and quite a bit of snow drifting - that means a lot of shoveling at MAPO since the building is now around ground level, so the wind can't blow underneath it anymore and that causes the wind to deposit a lot of snow around the building. First aururoas were visible, the sky is still pretty bright so they were faint even though the must have been quite bright. We are now in nautical twilight, i.e. the sun is between 6° and 12° below the horizon. Already April, we passed through civil twilight, i.e. 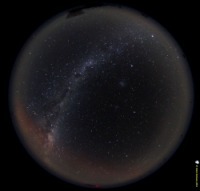 the sun is now more than 6° below the horizon, and it's getting dark outside, could see 7 stars so far, the first 3 stars of the Southern Cross are visible, a few more days and we might see the first auroras if they are bright enough. Totally switching to nights today, since we switched back to normal time last weekend and the only time I can really work on the telescope is during the fridge cycle which is now between around midnight and seven in the morning, but shifting forward 4 min per day. The sun is gone, and won't return until September - 6 months polar night. But it's far from dark yet, the different stages of twilight which take about 1 hour back home, take about 4 weeks here. The moon is up and a few days ago I could spot Venus for the first time, today I saw the first star. Every day is different now and the polar night actually is the best time of the year, can't wait to see some auroras again. On the 19th we had an awesome sunset dinner :) and today was probably the last time to see a glimpse of the sun, equinox was on the 21st at 12:21, but then it takes a few days for the sun actually to disappear, the actual sunset can last up to 4 days, depending on atmospheric conditions and horizon view. Yesterday we saw some nice green and blue flashes. The sun is getting lower every day and your shadow is growing - the time of the long shadows as I call it. 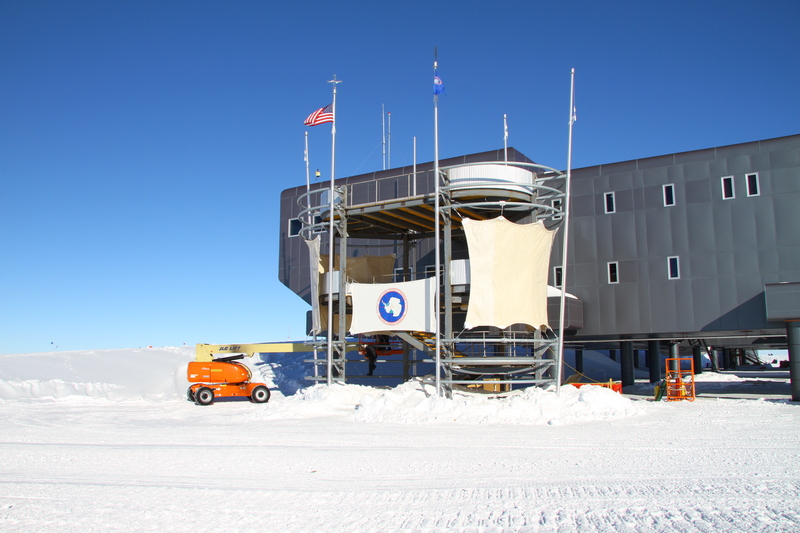 Most of the station closing tasks are finished and we are settling in for winter. A bit more than 2 weeks until sunset. We slowly getting the telescope into a working unit with the help of all the people up North since it was still in a kind of unfinished state when everybody left. Last Monday I started my introductory course to astronomy, most of the staff down here have nothing to do with astronomy, but now we gonna get the longest night on Earth so it is an opportunity to learn a bit more about the night sky. Winter has begun, the last Herc left on the 15th. We had 3 more Twin Otters and a Basler on deck but the last of them also left yesterday. The last weeks were crazy like usual for closing. We just got the last receiver mounted 2 days before everybody left, so there will be still a lot of troubleshooting and babysitting for the next few weeks, but that's what I'm here for :). It was nice to see the station population drop every day a bit more. We are 49 winter-overs this year. The last week was already busy with closing tasks and getting the station ready for winter. The sun is getting noticeably lower and it's only 4 weeks until sunset. Today we got the sad news that another strong earthquake hit Christchurch, we only got emails so far, but it looks like it was quite devastating, all the best to all our friends and all the Kiwis there. See some pictures of the R&R in NZ, and check out Fraser Gunn's website for some astonishing landscape, astrophotographie and timelapse pictures. On the way back we didn't had any major delays, our first attempt to fly back to Pole on an LC-130, failed due to strong vibrations so we had to shut off one engine, but we got 3 more :) After a couple of hours at Pegasus field, the airfield in McMurdo at that time of the year, we had a smooth flight to Pole. Now I'm already back for over a week and we still got 2 receivers in the lab that we need to get up onto the telescope, but we mounted a huge mirror to look over the ground shield to do some calibration measurements. 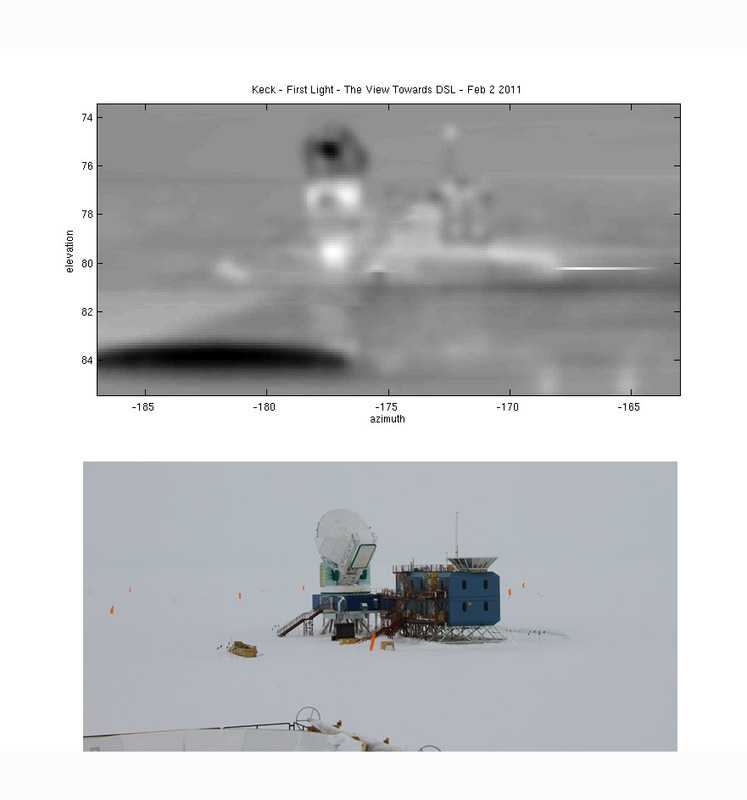 The following image is basically our "first light", the above image is a picture in at 2mm wavelength, i.e. in the microwave spectrum. It shows the data of only ONE pixel, scanning over the entire field of view. Below is the optical counterpart. Warmer areas appear bright in the microwave image, colder ones darker. 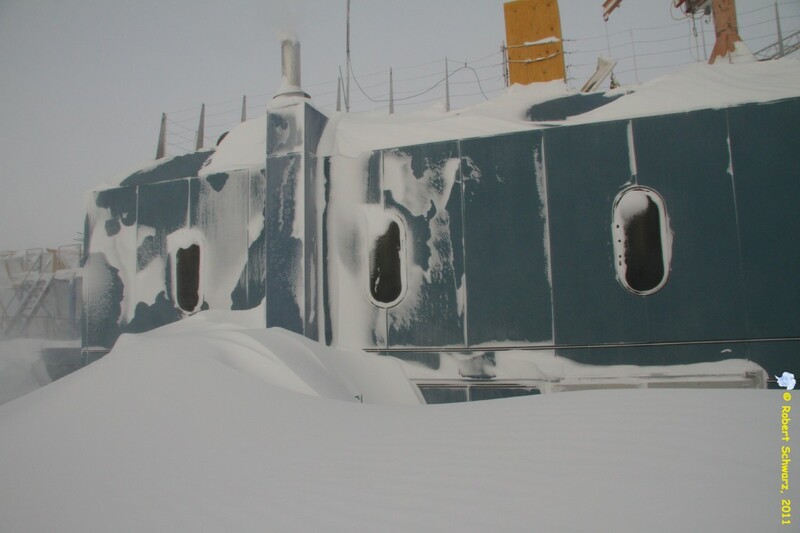 Still stuck in McMurdo, time in NZ is shrinking fast, and we just got word of another delay :( although the weather is fine, here.... what is the hold up? But anyway we try to make the best out of our stay here. At least I find some time to work on my homepage as well, although I don't got all my pictures with me. Our first receiver is mounted in the telescope for a few weeks now, the second one is closed up and just cooled down to 4K, the third one is about to be closed up in the next days. Time is flying and we don't have much margin for error now, we should have all 3 receivers for this year on the mount soon, so we can do the final testing and get everything ready for our observations. Of course we know it never goes that smooth so there is still a lot of work to do. We just saw it again with our windows, the top part of the telescope, which apparently can't get cold, but of course it's cold outside so we have to be heating them now permanently to prevent the epoxy from cracking and hopefully find a better solution for next year. 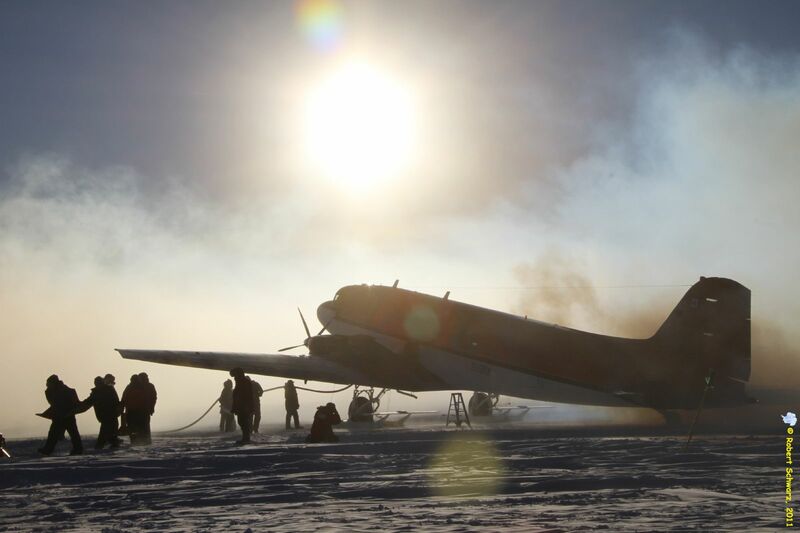 Last weekend there was the Marathon in McMurdo, our winners from the "Race around the world" were supposed to go as well, but again weather or what ever prevented them from flying to McMurdo on Saturday. 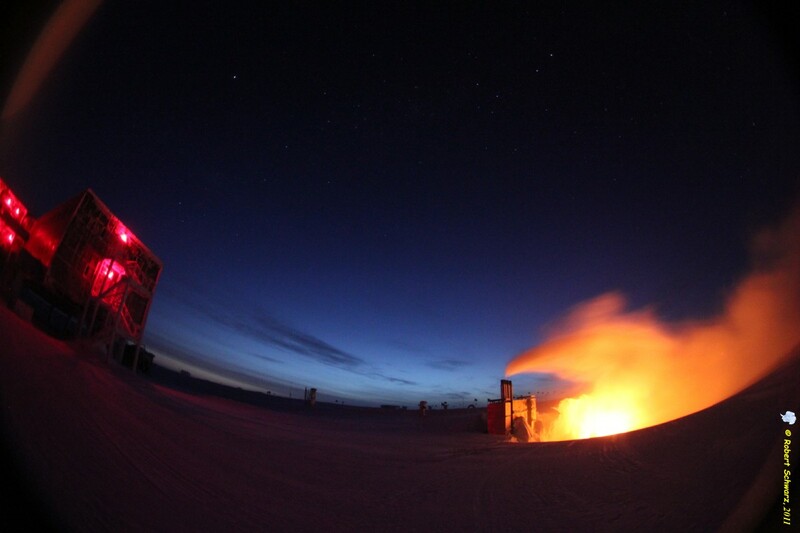 The runners were totally bummed and decided to do a first - a Marathon at the Pole, they figured out, how many times they have to run up and down the skiway to get 42.2 km or 26.5 miles and everything at around -27 C without windchill and at over 3000m altitude. Four runners completed the whole distance, the best time was just over 4 hours, what an amazing accomplishment, congratulations. 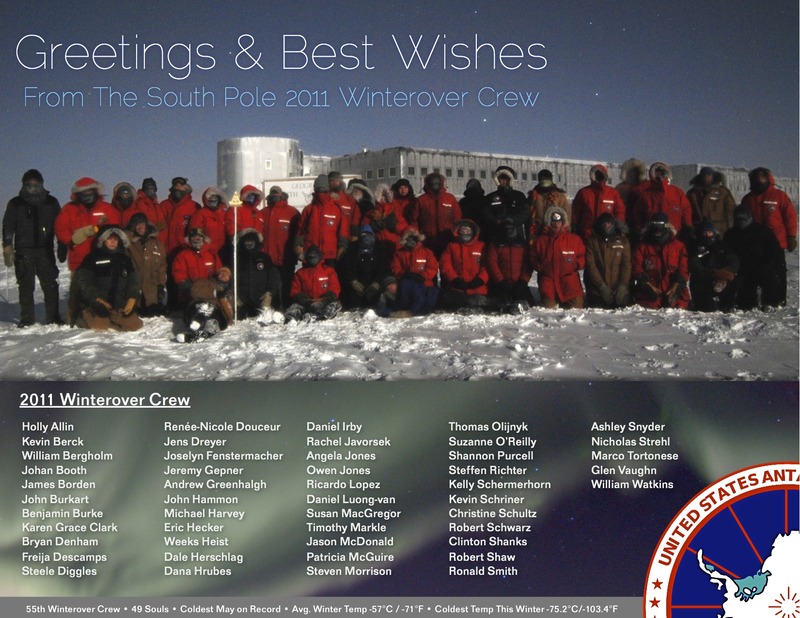 Busy time here at the Pole, lot's going on, but I'm back in McMurdo for a few hours now, going for a week vacation back to NZ, - weather permitting, the plane is already on weather delay. more updates soon. 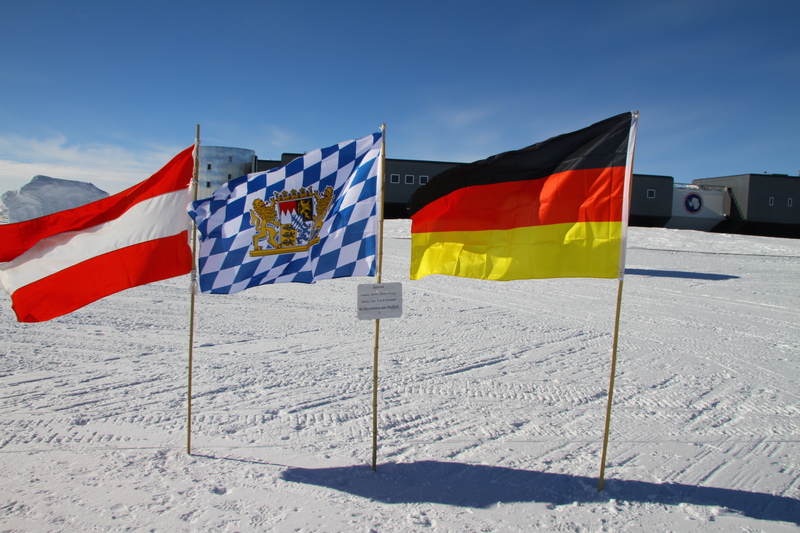 It is 2011, another year went by, and another new year's eve at the Pole, but this was very different, since we had a party outside, the Austrian and German Skiers weren't allowed to come to the station besides the official tour they got, so we decided to have a party out at their camp, which meant being about 4 hours outside at -26°C, but it was a calm beautiful day and we had an awesome time. Well the Austrians and Germans arrived, congratulations to both teams - both were faster than expected, but one team even faster :), but again even more politics, we are not allowed to say who won ;) It was great to have some countrymen down here again (yes I'm counting the Austrians to that as well ;) ) and it was great to talk to them and share some Antarctic experiences with them. They just left a few hours ago, have a great trip home and enjoy the warmer weather up North. 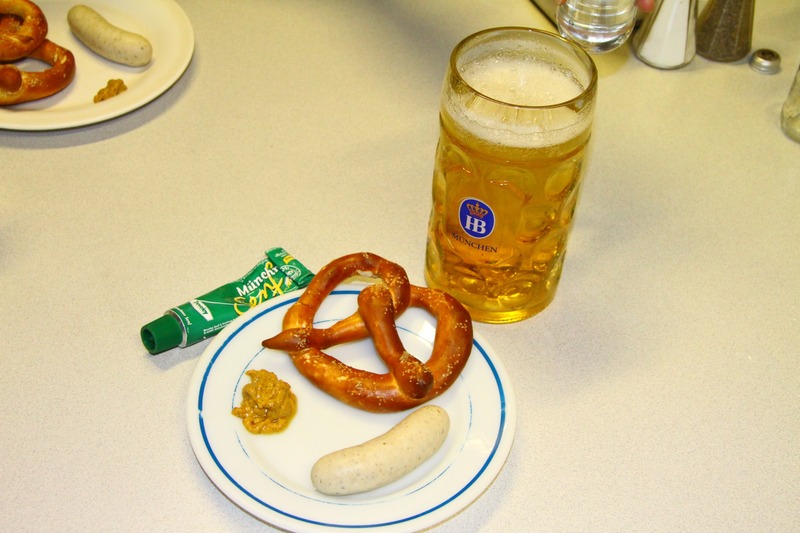 The Germans and Austrians are coming! 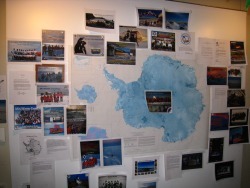 You might have heard about their race to the Pole in honor of Amundsen and Scott. There are 2 teams consisting out of 4 people each, the German team: Joey Kelly, Markus Lanz, Claudia Beitsch and Dennis Lehnert the Austrian team: Hermann Maier, Tom Walek, Sabrina Grillitsch and Alex Serdjukow. 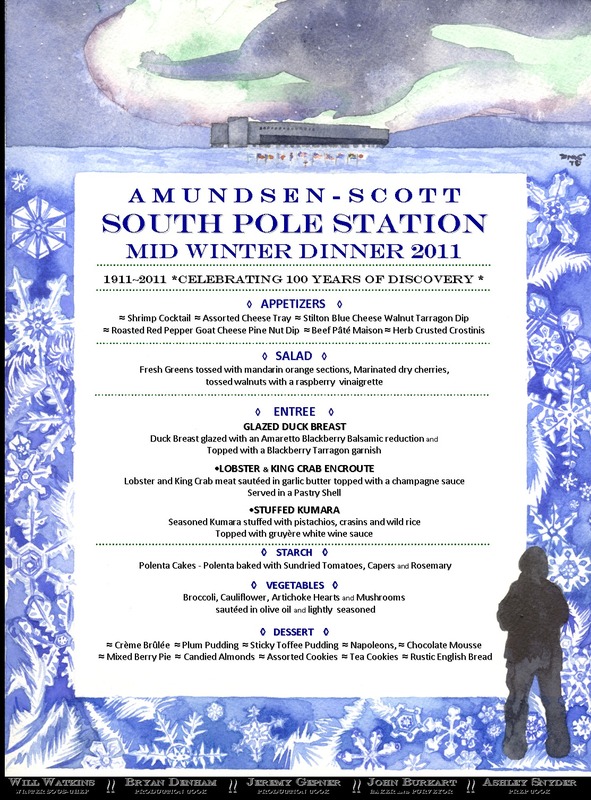 The teams are accombined by TV teams which will screen a docu event in 5 parts about Amundsen and Scott next year for their hundreds anniversary of reaching the Pole. I just put some flags out to welcome them - unfortunately now, NSF has a quite a ridiculous policy about NGOs - non government organizations. I can totally understand we can't support them with station facilities and resources and I can understand some of the guide lines, especially since there are so many tourists coming now, but that we are not even supposed to speak to them now, and when approached we are only supposed to talk about personal stuff, but not mention our work etc. well, that seems kind of hard, since the first question that normally comes up is what are you doing down here - so I say partying, since that is private, but I can't mention the first class science that is happening here and not that we are doing anything secret here, our work is all over the web anyway - so in what light does that leave NSF?? Also there are experiments with an international collaboration down here, with money from other country's tax payers, like Icecube, so they are not allowed to hear what's going on down here!? If NSF is concerned about their reputation then that will do exactly the opposite - what happened to the good old times. NSF should be grateful that their station and science projects are mentioned also on an international scale - that is free promotion. Yesterday we had the "Race around the World" in the morning, followed by brunch and then in the evening our big x-mas dinner. Work is progressing and we got our first cryostat cooled down and the fridge cycle was running on x-mas eve, still battling a bit with the glycol cooling loop, but looks like we figured it out. I was hoping so much the design team was finished screwing with the station (see the awful hallways) but now they put big "membranes" up, which look like drying the mammoth hides from our last kill. They also put up some stupid bars which block now the best access to the station - another "well done" to the design team, great job, hope you don't screw up anything more down here!! Last weekend we had another famous James Brown Bingo night and afterwards screening the Rocky Horror Picture Show in the gym. Quite a few people came dressed accordingly :) I like the music, but I think I never managed to watch the whole movie. Today, 99 years ago, Roald Amundsen and his team, Olav Bjaaland, Helmer Hanssen, Sverre Hassel, Oscar Wisting,with 16 dogs, arrived at the Pole (90°00'S). They arrived 35 days before Scott's group. Amundsen named their South Pole camp Polheim, "Home on the Pole", and renamed the polar plateau Kong Haakon VII Vidde, "King Haakon VII Plateau". They left a small tent and a letter stating their accomplishment, in case they did not return safely to Framheim. The five expedition members returned to Framheim on January 25, 1912 with eleven dogs. 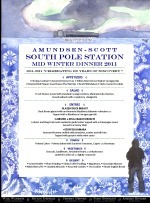 On their return, Henrik Lindstrom, the cook, said to Amundsen: "And what about the Pole? Have you been there?" The trip had taken 99 days, one day short of their original plan of 100 days, and the distance they covered was about 3,000 km (1,860 miles). First month at the Pole, time is flying already again. Had to wait for a while for crucial cargo, but all is here now and we made finally some good progress on the mount and drive system of the new telescope. The old drum was exchanged with the new one on Thursday. Which was quite a milestone for the new project and went flawless thanks to the great and competent support we get on station from our carpenters, crane operators and all the others that support the science down here. 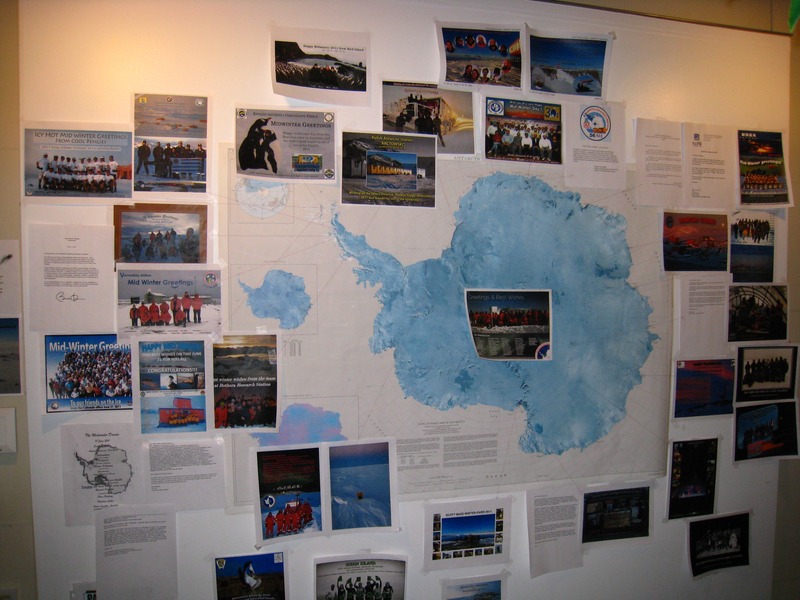 We already got quite a few tourists this season, it is still one season early for the 100th anniversary for Amundsen and Scott to reach the South Pole. 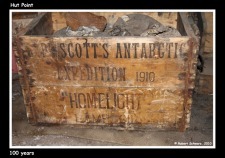 Amundsen arrived here in Dec 1911 and Scott in Jan 1912. We experiencing some satellite issues, at the moment we only have connectivity for a few hours on the slow GOES satellite, so it is hard to upload new pictures, hope we will have a good connection soon. Had an uneventful flight to Christchurch - the city that rocks - as the Kiwis refer to it now, after 2 months of ongoing afterquakes after the big earthquake on 4th of September. Had a beautiful day when we arrived, but unfortunately less then 48 hours there. Boarded a flight to the Ice yesterday - supposed to be a straight through to the Pole, but a big storm there, keeps us here hanging around in Mctown, waiting to go South. Leaving the US for NZ. Arrived in the US on October 3rd, working at the University of Minnesota in Minneapolis. There were still a lot of things that had to be done and finished before they could be crated up and sent to the Pole.